When I returned from my backpacking trip, I unpacked all the boxes I sent home like a kid on Christmas morning. Some of the stuff had sentimental value, some of it was just as cool as I'd remembered when buying it, and a small percentage fell into the “why the hell did I buy this” category. Going forward, I'll be sharing some of the cool souvenirs I picked up on my journey. To kick things off, I present a rectangular box with turquoise and coral inlay. Both stones are very common to Tibetan crafts. On the box, you'll see the omnipresent “Om” symbol. 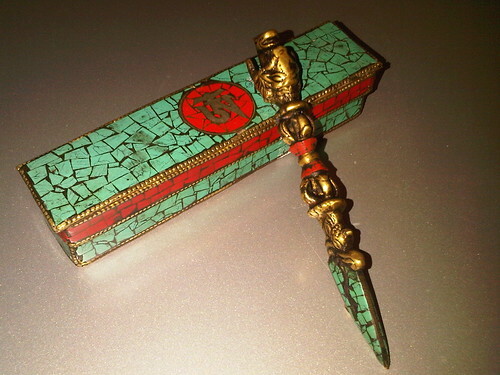 The actual religious object, which looks akin to a dagger, is full of iconography starting at the top with an animal head, then moving into the lightning bolt (if I recall correctly) which has the red coral in the middle of it, and then a dragon's head from which the turquoise-tipped point emerges. The Tibetan gentleman (pictured) who sold it to me on a side street in McLeod Ganj, India explained the symbolism of it all to me (with help from his Mom), but I soon forgot. Someday, I will look it all up again. 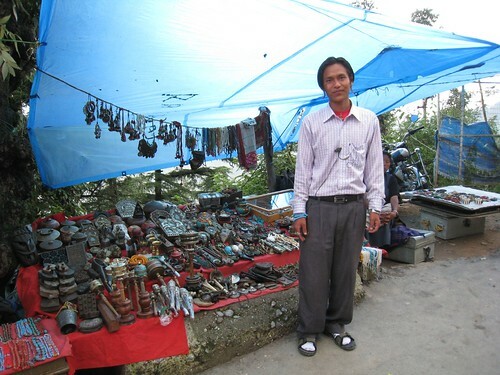 My first encounters with genuine items from Tibet occurred in Nepal. It was there that I initially grappled with the ethical dilemma of whether it was appropriate for me to be purchasing such items. After all, couldn't it be considered a Western robbery of Tibet's cultural heritage? Maybe I was over thinking it, but if Tibetans fleeing their homeland know that tourists are paying a lot of money (by local standards) for such items, perhaps it would encourage them to bring more to sell. I presented my concerns to several Tibetans selling their wares. One gentleman who appeared to be in his early twenties, convinced me that it wasn't necessarily a bad thing. He argued that Westerners will take the items home to their countries and care for them – in effect, preserve the cultural heritage of Tibet. Though I was contemplating a purchase from this man (and eventually went through with it), I could sense he was being sincere by the tone of his voice. The religious item of turquoise, coral and metal from Tibet is dear to me. I feel like it is a small connection I have to a country that I was just a few days away from setting foot in for the first time. It is my connection to a people that remain at war with China over religious freedom. It was clearly handmade. It was probably the property of an upper-class Tibetan. I imagine it has a rich and mysterious history, and hopefully I can give it a safe home for the rest of my life. That’s a really beautiful box and … ummm, thing. Thanks – actually the Tibetans are sorta known for being steely bargainers. Of course I negotiated on the price, but I did end up paying about $50-60 for it. At the time, it seemed like a lot, but I’ve seen Tibetan stuff marked up 500% in places like Bern, Switzerland and New York City, so I know it could fetch a lot of money on Ebay or something. But, it has sentimental value, so that’s not even a thought which has occurred to me. I doubt I’ll be in Nepal or northern India again any time soon!